I just replaced the last of my four Verizon FiOS DVR boxes with a TiVo Roamio DVR box. The last time I used a TiVo was about seven years ago, it was a DirecTV TiVo box, commonly referred to as a DirecTiVo. At that time DirectTV was my only option for television service, TiVo the only option for a DVR, and AT&T DSL the only option for internet and phone. I then moved to an area where I could only get Time Warner Cable for internet and TV, and only Verizon for phone service. I used TWC for internet and TV, and Vonage VoIP for phone service. The TWC DVR sucked compared the TiVo that I was used, and so did their internet reliability, and so did their customer service. Let me just say how much I hate it that city councils, property owners, and service providers negotiate exclusive service provider agreements. Competition is good, and exclusivity and long service contracts leads to substandard offerings and poor service levels. A year later Verizon FiOS became available in my area, and I switched to Verizon FiOS for TV, internet, and phone. The Verizon DVR was the same Motorola hardware used by TWC, but different software. The Verizon DVR software was slightly better than the TWC software, but only slightly. The HD channel lineup and internet speed was the primary reasons for switching. About two years ago Verizon released new DVR hardware and software, a significant improvement over the old. The current DVR UI is all HD all the time, supports multi-room features, and offers mobile and web series management apps. All-in-all I was very happy with the DVR software, the only thing lacking was the number of tuners and the storage capacity. I’ve often considered switching to non-Verizon DVR solutions, like the Moxi or the Ceton Q. I tried a Window MCE box with a Ceton infiniTV6 ETH CableCard decoder, worked ok, but the form factor was not very practical, and it required constant maintenance. The Moxi is no longer available for purchase, and the Ceton Q appears to be vaporware. The TiVo Premiere was an option, but I found the cost prohibitive, and it did not offer substantially more than my Verizon FiOS DVR box. TiVo recently released the new Roamio range of DVR’s. They offer three variants, the Roamio, Romio Plus, and Roamio Pro, differences and details are here. These new devices offer 4 to 6 tuners, 75 to 450 hours of HD recording capacity, and pricing ranges from $200 to $600. You still have to pay TiVo $15 per month or a $500 lifetime TiVo service fee per device, as well as the $5 Verizon per-cablecard fee, a total of $20 per month. Compared to $20 per month for a Verizon multi-room HD DVR offering 50 hours of HD recording and 2 tuners, TiVo is equally priced on a month-to-month basis, costs more upfront, but offers significantly more capability and capacity. Amazon occasionally offers the Roamio units cheaper than TiVo direct, and weaKnees offers units with upgraded capacity. The TiVo Mini is a playback only device that lets you watch live or recorded TV. You need to pair it with a Roamio, and it acts like an extender for the Roamio UI. What makes no sense is that you need to buy it at $100, and then still pay a monthly $6 or lifetime $150 service fee. I am already paying a subscription fee for the main Roamio, why do I need to pay twice? I tested three TiVo devices, a Mini, a standard Roamio, and a Roamio Pro. The screenshots below shows the relative sizes of the devices. The Mini is very small, the Pro is thinner but wider than the FiOS DVR box, the standard Roamio is reasonable thin and small. The Mini and the standard use small wall mount external power supplies. 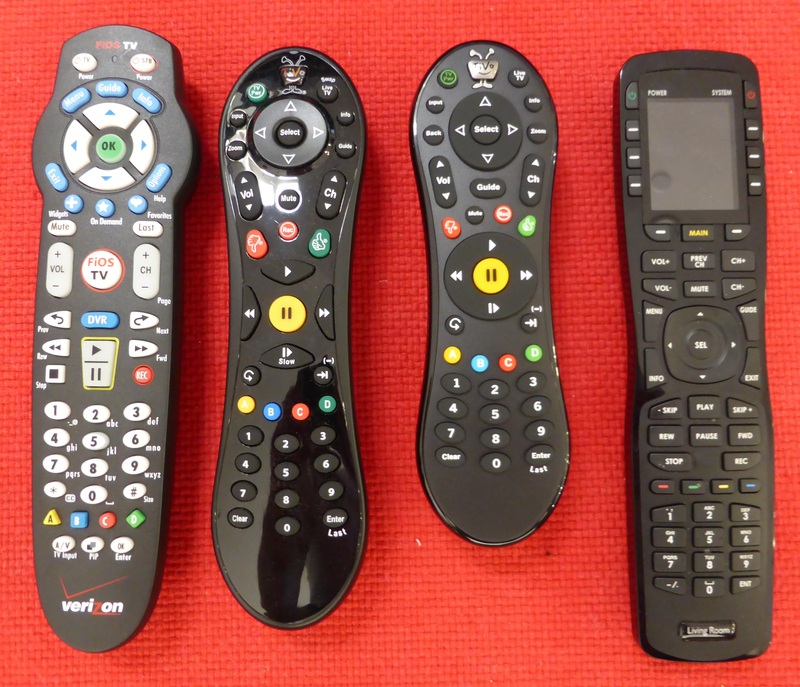 The screenshot below shows the relative sizes of the remote controls. The Roamio remote is smaller than the Mini remote, and supports both IR and RF, making it work through cabinet doors. The standard Verizon remote is ugly and bulky. I use URC MX-890 programmable IR/RF remotes with RF to IR base stations. I installed the Roamio Pro first, hardware setup was easy, the out of box experience was rather disappointing. The setup took a really long time, and one of the first screens you are greeted with tells you that the install will take more than an hour. The Pro setup, including reboots for updates, took about an hour. The Mini setup was even longer at about 1 hour 20 minutes, at times the Mini UI reported 99% completed for almost half an hour without any movement. I find it fascinating that a company that used to pride itself on user experience could come up with such a crappy first customer interaction experience. The cablecard activation required a call to Verizon. New cablecards can be activated online or over the automated phone system, but previously activated cablecards that are moved between devices needs to be re-activated by Verizon tech support. This was the only device with a previously activated cablecard, the other three boxes had new cablecards, and I activated them using the automated phone system. I immediately ran into network connectivity problems; the box would randomly report C130, C133, C501, and UI-113 errors. Manually verifying internet connectivity or TiVo service connectivity always succeeded. I contacted TiVo support, who told me the problem is my internet connection, and that network switches are not supported, and that I need to connect the TiVo directly to my router, what? My house is wired with CAT6 connected to a HP ProCurve gigabit switch, and each AV closet has a TrendNET TEG-S8g 8-port gigabit switch. Nothing wrong with my network, and nothing wrong with my internet access, the TiVo is the only device with issues. No point arguing with support, they suggested I disconnect ethernet and instead use the built-in MoCA bridge for internet connectivity. This worked, no more connectivity issues. After some more research I found similar issues reported on the TiVo Community forum, siting incompatibility with “green” or 802.11az compliant switches. 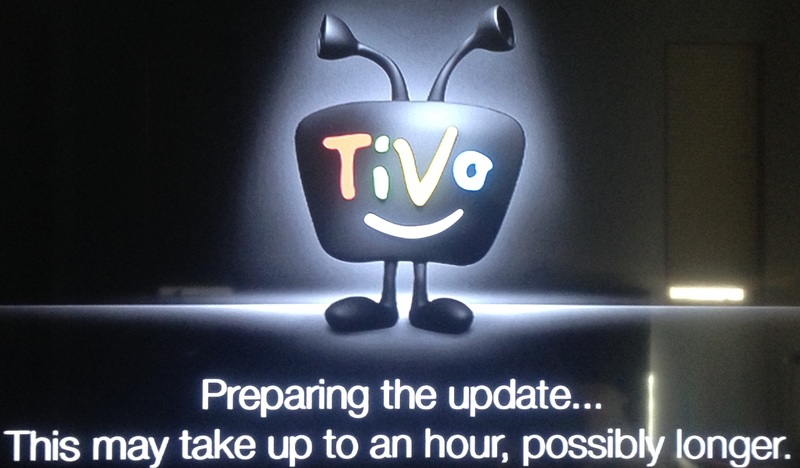 TiVo acknowledged the problem, and stated a future update would resolve the issue. I started out with a Pro and a Mini, while keeping my main FiOS DVR active for use by the family. I have become used to the slick HD UI of my FiOS DVR, compared to the TiVo, the TiVo UI really does look old, and ignoring the addition of internet video services, still looked about the same as it did seven years ago when I last used a TiVo. Not to say that they need to change something that works, but really, no changes, no color scheme updates, no graphics refresh, no stop button support? Unlike the FiOS box where you have to pick one output resolution, 720p or 1080i, and all input resolutions are scaled to that output resolution, the Roamio lets you select multiple supported output resolutions, 480p, 720p, 1080i, 1080p60 and 1080p24, this has pros and cons. If you enable multiple resolutions in the Roamio, and the menu you are navigating to does not have HD support, like settings, the screen will switch resolutions as you navigate between menu’s, causing a temporary delay and black screen as the resolution changes. On the positive side, if the video source resolution matches a supported output resolution, the video will be passed through without scaling, allowing the destination device to perform the scaling. SD channels are typically 480i, and HD channels are 720p or 1080i. I performed non-scientific visual appearance tests using Disney Junior and Nick Junior 480i SD channels. Setting the Roamio to one of 720p, 1080i, or 1080p only, resulted in significant artifacts very noticeable around the channel logos. The FiOS box set to 720p or 1080i showed no such artifacts. Setting the Roamio to output at all resolutions (except 480i that is listed as not supported), it produced output at 480p for the 480i material, and resulted in reasonably good quality, equal to or better than the FiOS box. This leads me to believe that the Roamio is not good at scaling video material, or at least not as good as the FiOS box. Preferring image quality, I enable all supported resolutions. Setup is tedious and time consuming. When pressing the TiVo button, there is a short pause in the playback stream before it is displayed in a window on the main UI, and when returning to the full screen view there is a gain a short pause. Compared to the FiOS box where the video remains smooth moving from full screen to windowed and back never skipping a beat. On the Mini, as soon as you press the TiVo button it stops playing whatever you were watching. Unlike the regular Roamio boxes, and the FiOS box, the Mini never displays the current watching video in the main UI. This is a big negative for the Mini, I often switch to the menu to search for and add shows to watch as trailers air on the current show. With the embedded video I can keep watching and still use the menu system, on the Mini it is one or the other. On the Roamio, while playing live TV, and pressing the TiVo button, the TV stream will continue to display in an embedded window in the main UI, but if you were playing recorded content, the feed would switch to live TV, and there is no way to return the playback to full screen. The FiOS DVR does this seamlessly, you can navigate between the menu system and back to full screen without interrupting the feed, be that live TV or a recording on this or another device. The FiOS box menu and UI system is all HD all the time. On the Roamio and the Mini, only the main window and main functionality is in HD, many of the settings and other menus are in SD. When navigating around the UI, and the resolution switches from HD to SD, there is a noticeable delay and black screen as the video equipment adjusts to the new resolution. It looks as if TiVo ran out of time to convert all UI to HD, or maybe they don’t care about looks? On the FiOS box the skip forward and skip back buttons skip the same amount of time. On the TiVo the skip forward skips 30s and skip backwards / replay skips 8s only. Being used to using the skip buttons to go forward or backwards, I find the 8s replay functionality mostly useless, and instead end up using the less convenient rewind most of the time. When navigating the UI, specifically when adding a season pass, there is often a few seconds of delay where the UI is not responsive showing no indication of accepting and processing the input command, again, poor UI responsiveness leads to poor usability. I already mentioned this, I find it preposterous to have to pay a monthly service fee for the Mini when I’m already paying for the main DVR service. The basic Roamio does not support MoCA, meaning many users will need to purchase a MoCA bridge for internet connectivity. The Mini supports MoCA, why not the basic Roamio? Combining the cablecard fee and the TiVo service fee, there is no financial incentive to switch to a Roamio. No stop button, I really don’t know why they don’t include a stop button. In order delete this show, or go back to the menu, without loosing location context, you need to press the left button. Power on to fully functional takes much longer than the FiOS box. Amazon video does not support Amazon Prime free content. Netflix UI navigation not as good as Roku. As already described, video up-scaling results in artifacts. 6 Tuners compared to FiOS 2, no more conflicting recordings and live TV. 3TB storage and 450 hours recording compared to FiOS 50 hours, no more shows getting deleted before they can be watched. The TiVo iPhone and iPad apps are much better than the equivalent Verizon apps. The Watch Now functionality, no more guide surfing or channel hopping, see everything related to your watching habit on one page. Automatic recording of related shows, nice to explore previously unknown shows or just to watch something new. Pressing skip forward multiple times aggregates the skip distance, making it easy to skip in well known fixed increments, i.e. skip over fixed length ads. In the end the 6 tuners and 450 hours of capacity were the most important reasons for switching. If the Mini’s supported displaying the current play feed while using the menu, I would have used one Pro, upgraded to 8TB, and three Mini’s. But since the basic Roamio is only $100 more than Mini, there is little point in buying a Mini. I ended up installing two Pro’s and two basic’s, the Pro’s in the game and living rooms, and the basic’s in the guest room and master bedroom. Enough space and enough tuners to keep everybody happy.